The growing importance of integrated drainage basin management (IDBM) plans, and the costs and benefits they bring. Case study of one recent IDBM plan. Use the resources to create a working definition of IDBM. "Integrated river basin management (IRBM) is the process of coordinating conservation, management and development of water, land and related resources across sectors within a given river basin, in order to maximise the economic and social benefits derived from water resources in an equitable manner while preserving and, where necessary, restoring freshwater ecosystems." "IRBM rests on the principle that naturally functioning river basin ecosystems, including accompanying wetland and groundwater systems, are the source of freshwater. Therefore, management of river basins must include maintaining ecosystem functioning as a paramount goal. This 'ecosystem approach' is a central tenet of the Convention on Biological Diversity. River basins are dynamic over space and time, and any single management intervention has implications for the system as a whole. VISION: Long-term vision for the river basin, agreed to by all the major stakeholders. INTEGRATION of policies, decisions and costs across sectoral interests such as industry, agriculture, urban development, navigation, fisheries management and conservation, including through poverty reduction strategies. 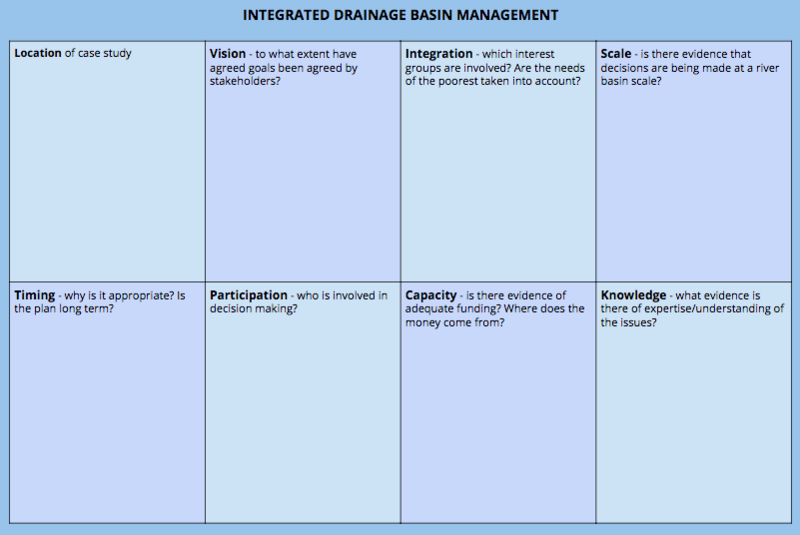 SCALE: Strategic decision-making at the river basin scale, which guides actions at sub-basin or local levels. TIMING: Effective timing, taking advantage of opportunities as they arise while working within a strategic framework. PARTICIPATION: Active participation by all relevant stakeholders in well-informed and transparent planning and decision-making. CAPACITY: Adequate investment by governments, the private sector, and civil society organisations in capacity for river basin planning and participation processes. KNOWLEDGE: A solid foundation of knowledge of the river basin and the natural and socio-economic forces that influence it." ​Explore the WWF website (right) and select one example of IDBM. For your example, use the seven characteristics of successful IRBM to describe and evaluate the example you have chosen.